The life of a Christian is nothing but a perpetual struggle against self; there is no flowering of the soul to the beauty of its perfection except at the price of pain. In order to pray well, it is not enough to give expression to our petitions by means of that most excellent of all prayers, the Rosary, but we must also pray with great attention, for God listens more to the voice of the heart than that of the mouth. To be guilty of willful distractions during prayer would show a great lack of respect and reverence; it would make our Rosaries unfruitful and make us guilty of sin. do not pay attention to what we are saying? How can we expect him to be pleased if, while in the presence of his tremendous majesty, we give in to distractions, like a child running after a butterfly? People who do that forfeit God's blessing, which is changed into a curse for having treated the things of God disrespectfully: "Cursed be the one who does God's work negligently." Jer. 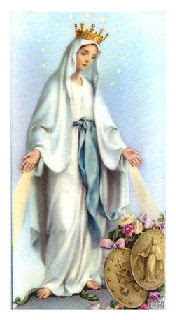 48:10.
presence of God and imagine that God and his Blessed Mother are watching you, and that your guardian angel is at your right hand, taking your Hail Mary's, if they are well said, and using them like roses to make crowns for Jesus and Mary. But remember that at your left hand is the devil, ready to pounce on every Hail Mary that comes his way and to write it down in his book of death, if they are not said with attention, devotion, and reverence. 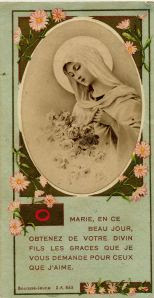 Above all, do not fail to offer up each decade in honour of one of the mysteries, and try to form a picture in your mind of Jesus and Mary in connection with that mystery. VATICAN CITY, DEC. 19, 2006 (Zenit.org).- The Vatican Museums provide an "extraordinary opportunity for evangelization," Benedict XVI said on the occasion of the institution's 500th anniversary. The Pope said this Saturday during an audience with the participants of an international congress which closed a year of events commemorating the long history of the Vatican Museums. The Holy Father described them as "the greatest museum institutions in the entire world." Benedict XVI congratulated those participating in the symposium to reflect on the identity and role of the museums today, and their prospects for the future. The congress identified "elements that make it possible to better delineate the function, which we could describe as 'educational,' of museums in the context of the present globalized society," said the Pontiff. The Pope said that "the Church has always supported and promoted the world of art, considering its language as a privileged vehicle of human and spiritual progress." The Vatican Museums have the following inscription placed on the main door: "Ad augendum Urbis splendorem et asserendam religionis veritatem" (To promote the splendor of the city of Rome and affirm the truth of the Christian religion). Benedict XVI continued: "The development in time of the Vatican Museums shows that these ends have always been clearly present in the Popes' intentions." The Vatican Museums "can represent an extraordinary opportunity of evangelization because, through the different works exhibited, they offer visitors an eloquent testimony of the continuous intertwining that exists between the divine and human in life and in the history of nations," added the Pope. The Holy Father said: "The enormous number of people that visit them every day shows the growing interest in these masterpieces of art and these historical testimonies, which are a marvelous synthesis of the Gospel and culture." The Pontiff said that the museums are no longer "reserved for artists, specialists and men of culture alone, in our days it is increasingly everyone's home, thus responding to a widespread formative need of society." Benedict XVI added that the institutions belong as well to the youth, "which can recognize in the museums the roots of their history and culture." The Pope said that "every opportunity to foster integration and encounter between individuals and nations is, undoubtedly, something that should be stimulated." "In such perspective, also museums -- though keeping in mind the changed social conditions -- can become places of artistic mediation, links of relationship between the past, the present and the future, crossroads of men and women of several continents, in addition to sources of research and forges of cultural and spiritual enrichment," the Holy Father said. The Pontiff said: "The museums will be able to spread the culture of peace if, while retaining their nature of temples of the historical memory, they are also places of dialogue and friendship among all." "I reminded the entire Church of the central and irreplaceable nature of the Eucharist in Christian life, in order be faithful to the vocation to sanctity. 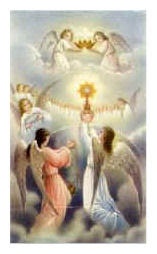 Make the Blessed Sacrament the pinnacle of spiritual life and an inspiration for every missionary and apostolic project. In effect, in the Blessed Sacrament we encounter Christ, and therefore, it is a privileged point of encounter for souls in love with Him." "Live the just-begun Year of the Eucharist as an intense time of encounters with Christ," "discover in this incomparable treasure that Jesus left us the joy and goodness of the loving presence of the Savior"
Fight all error, but do it with good humor, patience, kindness, and love. Harshness will damage your own soul and spoil the best cause. Be nice. Do not be mean. Be respectful. Be sweeter than honey, but do not water down the truth. Sound doctrine, with sweet honey. Custos Fidei has the list so make sure to check it out their blog. truth, is there a Santa Claus? CLICK HERE for the Editor's response. Many years ago, a candy maker in Indiana had an idea to show through the candy he made, that Jesus Christ was born among us, lived and died to save us all. 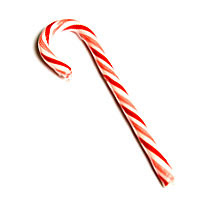 So he created the candy cane. He began with a stick of pure white, hard candy. White to symbolize the Virgin Birth and the sinless nature of Jesus; hard to symbolize the Solid Rock, the foundation of the Church, and the firmness of the promises of God. The candy maker made the candy in the form of a "J" to represent the precious name of Jesus, who came to earth as our Savior. It could also represent the shepherd's staff, reminding us that Jesus is the Good Shepherd. Thinking that the candy was somewhat plain, the candy maker stained it with red stripes of the scourging Jesus received by which we are healed. The large red stripe was for the blood shed by Christ on the cross so that we could have the promise of eternal life. 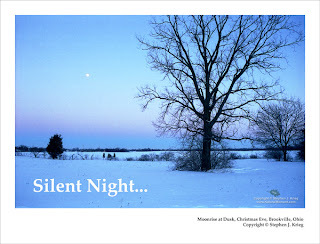 It is said that Clement Moore wrote the "Night Before Christmas" for the enjoyment of his children. The same motive was the inspiration behind this poem by Sister Mary Thomas many years ago. Thus the true story of the "Night before the First Christmas. " And the grownups wouldn't bother. There's no room, they said. Let's go there," said Mary. It's silent and still." Announce the glad tidings My Son Comes to give." The angels assured them they'd nothing to fear. "It's Christmas," they said. "The Saviour is here!" "Glory to God in the highest; Peace to men of good will." "In the crucifix we see Jesus but he is not there. 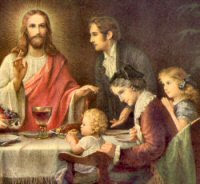 In the Eucharist we don't see Jesus, but he is there." 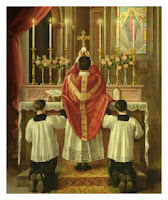 Whenever I go to the chapel,I put myself in the presence of our good Lord, and I say,"Lord, I am here. Tell me what you would have me do." what we see and hear and feel. Thank God for that challenge! 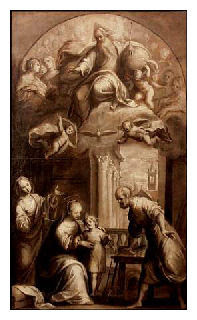 Please click title above for the entire article which includes suggestions for praying as a family. this opportunity to meditate the passion of Christ. As I bless myself with the sign of the cross, I clothe my soul with the holy wounds of Jesus Christ who died for my sins.The image of my soul which has been destroyed by sin receives restoration and protection from my Lord and Saviour. purified from all my sinfulness, deliver me Lord from all evil." I bless my soul with the holy wounds of the sacred head of Jesus and the sufferings of His holy mind, so that I may always keep my soul in the Presence of God. I bless my soul with the wounds of His sacred feet, so that I may always walk in the path of Salvation and proclaim the Word of God to others. In the name of the Holy Spirit, I bless my soul with the wounds of His sacred hands, that I may always do the work of God. While you are at it, please visit this website Work of God where the above was from. VATICAN CITY, DEC. 17, 2006 (Zenit.org).- Benedict XVI remembered people who will spend Christmas in the cross fire of war, especially in the Middle East and Africa, or in conditions of loneliness and poverty. Christmas, when Christ enters the world to save humanity, "is a prophetic proclamation destined for the whole of humanity, in particular, the poorest, in this case, those who are poor in joy!" the Pope said. The Holy Father made his comments today to the thousands of people gathered in St. Peter's Square to recite the Angelus. He referred to the readings of this Sunday's liturgy, which call for joy, as "The Lord is at hand." 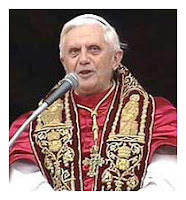 "This promise was fully realized in the mystery of Christmas, which we will celebrate within a week, and which it is necessary to renew in the 'today' of our lives and in history," Benedict XVI said, speaking from the window of his study. 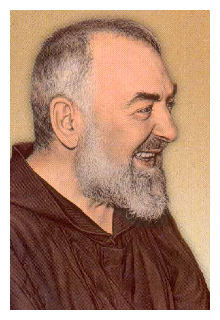 He continued, "The joy awakened by the liturgy in the hearts of Christians is not reserved to them alone: It is a prophetic proclamation destined for the whole of humanity, in particular, the poorest, in this case, those who are poor in joy!" The Pope mentioned in particular "our brothers and sisters who, especially in the Middle East, in some areas of Africa and in other parts of the world, live the tragedy of war." "What joy can they experience? 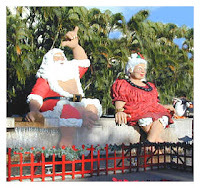 What will their Christmas be like?" he asked. "Let us think of all the sick and lonely people who, in addition to having physical suffering, suffer in the spirit, as often they feel abandoned. How can one share joy with them without lacking respect for their suffering?" The Holy Father also invited his listeners to think of those, "especially young people, who have lost the sense of authentic joy, and who seek it in vain where it is impossible to find: in the exasperated race for self-affirmation and success, in false amusements, in consumerism, in moments of drunkenness, in the artificial paradise of drugs and of other forms of alienation." "The Word of the Lord is addressed precisely to those who are being tested, to life's wounded and orphans of joy," assured the Pontiff. "The invitation to joy is not an alienating message, or a sterile palliative, but rather a prophecy of salvation, an appeal for rescue that starts with inner renewal." The Holy Father concluded by inviting Christians to do all they can "with humility and courage so that the world will welcome Christ, who is the source of authentic joy." Some new things are coming for the Catholic liturgy--and what that might be is beginning to become clear. One who is anchored in God does not suffer any loss,even if attacked by a thousand waves and a thousand storms. On the contrary, he emerges stronger. 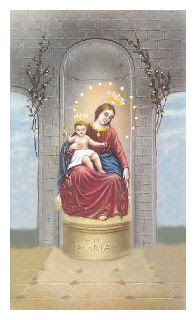 The Mother of God contained the infinite God under her Heart,the God Whom no space can contain. Through her, the Trinity is adored,demons are vanquished, Satan is cast out of heaven,and our fallen nature is assumed into heaven. to learn more about this project, please click the title above. 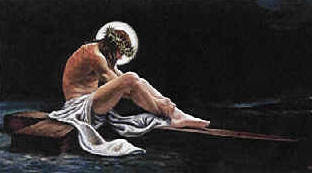 As love is paid for in love, I must imitate Him, sharing in spirit all His sufferings. I must consider how much I owe Him and what He has done for me. Putting these sufferings between God and my soul, I must say, "What does it matter my God, that I should endure for your love these small hardships?" Vatican to Catholic Homeschoolers - Good Job! As a Catholic homeschooling mom, I could take the opportunity to tell homeschooling naysayers, "I told you so" But I won't :-) The following article speaks for itself. Vatican to Catholic Homeschoolers: "I truly admire parents, who take on this great commitment"
President of the Catholic Home School Network of America, and Mrs. Virginia Seuffert, home schooling mother of 12 and a frequent speaker at Catholic Home Schooling conferences, were encouraged by the positive response of the Vatican prelates. and hundreds of thousands of books sold. Students are enrolled primarily in the United States, but also from many countries from around the world, such as Canada, Australia, England, Ireland, Mexico, the Philippines, Japan, the Czech Republic, Germany, Colombia, and India. The home school envoys emphasized to the Vatican cardinals and bishops the primary importance of the Faith in Catholic home schooling. They explained that when parents teach the Faith to their children on a daily basis, teaching not only with textbooks but through the daily practice of prayer, good example, and frequent reception of the Sacraments, children will develop a love for the Faith and vocations will increase. They quoted one Midwest bishop who says that over a five-year period, 23 percent of young men graduating from one home school cooperative in his diocese entered the seminary. They pointed out that Justin Ferguson, the seminarian who gave the first reading at Pope Benedict's papal installation mass, is an alumnus of Seton Home Study School.